This product does use natural quality ingredients and it has been backed by a 100% money back guarantee and therefore, it could be viewed as an alright product. The below is an informative review for Viola Skin Retinol Serum that explores all the real facts about this product. The manufacturer claims that this product can protect your skin from the visible signs of aging and damage caused by environmental factors while also claiming that it can treat acne and acne scars. Additional claims state that this product will encourage firm, smoother skin. Retinol is beneficial as Vitamin A which can protect skin from damage and improve skin texture and skin health. Hyaluronic Acid may encourage wound healing and is also beneficial as a moisturizer. Vitamin E works as an antioxidant to protect skin from damage and encourage improved skin health. Jojoba Oil works as an emollient and can be used to treat acne and other skin conditions. Aloe Vera contains anti-inflammatory and soothing properties, it is also beneficial as an antioxidant. 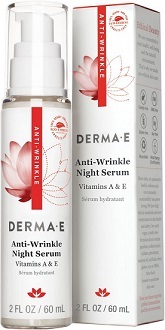 The ingredients used in this product seem to be clinically proven, however, effective an effective night serum should contain at least 10% active ingredients and a minimum of 5 patented ingredients that are clinically proven and therefore, this product lacks ingredients and may not be effective. Matrixyl 3000 is just one of many patented ingredients clinically proven to effectively fight the signs of aging and boost skin elasticity and skin tone and therefore, products containing this and other patented ingredients are more likely to offer effective results. It is suggested that you should wash and dry your facial area before applying an adequate amount of this serum onto your forehead, cheeks, chin, and neck and then massaging in circular motions until completely absorbed. Further instructions advise that you should allow to dry before applying any makeup and that you can use this product twice per day, in the mornings and evenings if you have normal or oily skin and only once per day, in the evenings, if you have sensitive skin. These instructions are clear and simple to follow. The suggested retail price for one 30 ml bottle of this product is $19.97 according to the manufacturer’s website, where you can purchase it online. There are no discounted prices or package deals offered which is not too disappointing considering that this is realistically a cheap product in comparison to most other similar products. The manufacturer does provide a 100% money back guarantee for this product that is advertised on their website. This guarantee is valid for 60 days according to the website. This product does use natural quality ingredients and it has been backed by a 100% money back guarantee and therefore, it could be viewed as an alright product. It is concerning that research advises it may be lacking ingredients such as clinically proven patented ingredients and this implies that it may not be effective. This product is also far too cheap which questions the general quality standards and the products ability to deliver its claimed results and furthermore, there are no customer reviews on the manufacturer’s website for Viola Skin Retinol Serum. Based on all the relevant aspects of this product, it, unfortunately, does not possess any superior qualities and so, we suggest that you should rather opt for a more suitable product available from leading brands because these products have proven to be effective.